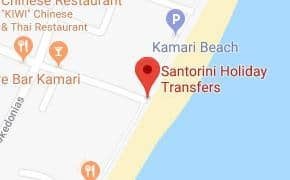 Keeping the quality and safety standards dictated by the European Union, Santorini Holiday Transfers continues its successful course by providing high-quality services. Since its establishment in 2010, Santorini Holiday Transfers has grown rapidly to become the favorite transfer services company in Santorini. We offer an unparalleled choice of services and destinations in Santorini that starts with many people transports and taxis for low-cost routes during the tourist season (April – November). Santorini Holiday Transfers and all our drivers are officially licensed by the Greek Ministry of Transport and are ready to offer a safe and comfortable service during your transportation. As we monitor all flights to Santorini in advance, there are no additional charges for flight delays.